Fresh Soul serves up all the Southern fixins. A taste of the deep South has arrived in Spokane. Fresh Soul, a new restaurant with a unique business model, is serving up traditional Southern comfort food staples that are often hard to come by in this part of the country: fried chicken, ribs, catfish, fried green tomatoes, jambalaya, seafood gumbo, collard greens, red beans and rice and more. Operating as a nonprofit through the community-focused Spokane Eastside Reunion Association (SERA), Fresh Soul is also running a teen job-training program for youth ages 14 to 18 to gain skills and experience to help obtain other entry-level positions after finishing the 16-week program. The restaurant and its training program, an application-based system with three teens currently enrolled, are overseen by SERA founder and director Michael Brown. Brown's wife Lorrie, daughter Michaela, sister Sandra Roberson and niece MacKenzie Hamilton are also working alongside staff in the kitchen and the front of the house. Fresh Soul has been a work in progress for the past three and a half years. It's located in a revived brick building that sat mostly unused for the past 40 years and before that was home to Flipper's Ice Cream parlor. To celebrate Fresh Soul's long-anticipated grand opening on July 19, the mayor, city council members and other local leaders attended a special ribbon cutting. Nearly all of the labor and materials to build out the restaurant were donated or funded by private donations, Brown says. Though he was able to draw from personal connections after many years in the construction industry, Brown, a man of deep faith, gives all the credit for his success to God. "People don't just give you this time and money to put something together like this," he reflects. 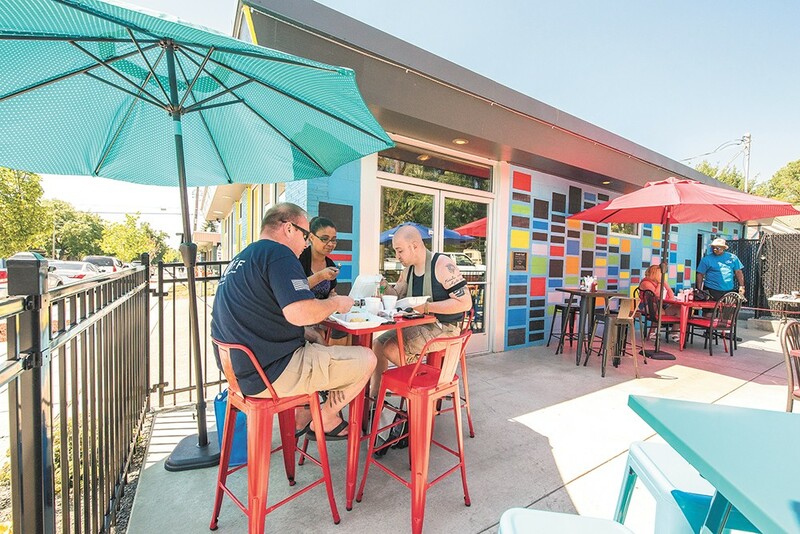 While the restaurant itself may be more of a destination for customers who don't live in the neighborhood, it's hard to miss once you reach Fifth Avenue, between Altamont and Thor streets. With a bright, sky blue facade and two colorful murals on the east and west sides of the building by artists Daniel Lopez and Ellen Picken, respectively, the space stands out like a welcoming beacon. A retro-style neon sign points directly down to the front door, and the awning lists all the classic Southern menu items in bright, bold lettering. Ribs, corn, collard greens and a biscuit at Fresh Soul. Most of Fresh Soul's menu comes from the traditions and kitchen of Lorrie Brown. "It's all passed down, all things we ate and things we enjoy — the spice, the intermingling of everything... all those good flavors that come together in one pot," Lorrie says, referring to her seafood gumbo. Because of the time-intensive cooking processes, Fresh Soul plans to rotate its gumbo ($9.50/small; $15.95/large) and jambalaya ($8.50/small, $12.50/large) on the menu every other weekend, with Lorrie's jambalaya — ham, beef sausage, shrimp, onions, green peppers, tomato and spices — served the first weekend of business. "Soul food, it's cooking from the soul. It's comfort food," she continues. If it's not cooked in a pot at Fresh Soul, it's probably fried or barbecued. 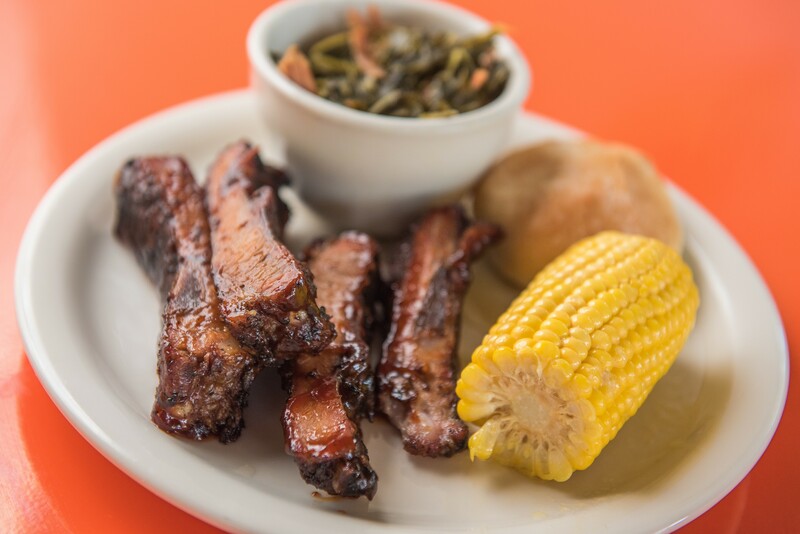 Ribs are offered in varying quantities (from one at $2.95 to a full rack for $30) and meal combos, like three ribs with two sides for $11.85, along with Southern-fried chicken legs, thighs, wings and breasts. A two-piece chicken meal with two sides is $8.50, while the "City of Spokane Special" comes with one rib, one chicken leg, a pulled pork sandwich, two sides and a large drink for $17.45. All orders can be placed to-go and ordered in advance for pickup. Sandwiches, meanwhile, include catfish ($8.50), a hot link on a bun ($4), pulled pork ($7.50), a hamburger ($4.75; $5.75 with cheese) and a fried green tomato sandwich ($9.50). Sides — baked beans, collard greens, red beans and rice, potato salad, mac and cheese, fries and rice — can each be ordered individually ($1.50-$5, based on size), as can cornbread ($1), a dinner roll ($1) or corn on the cob ($3). All drinks are nonalcoholic and include fountain soda, lemonade, coffee, sun-brewed sweet tea and a rotating flavor of ultra sugary Kool-Aid. "It's like, who has Kool-Aid at a restaurant," Lorrie says, laughing. The original print version of this article was headlined "Feeding the Soul"